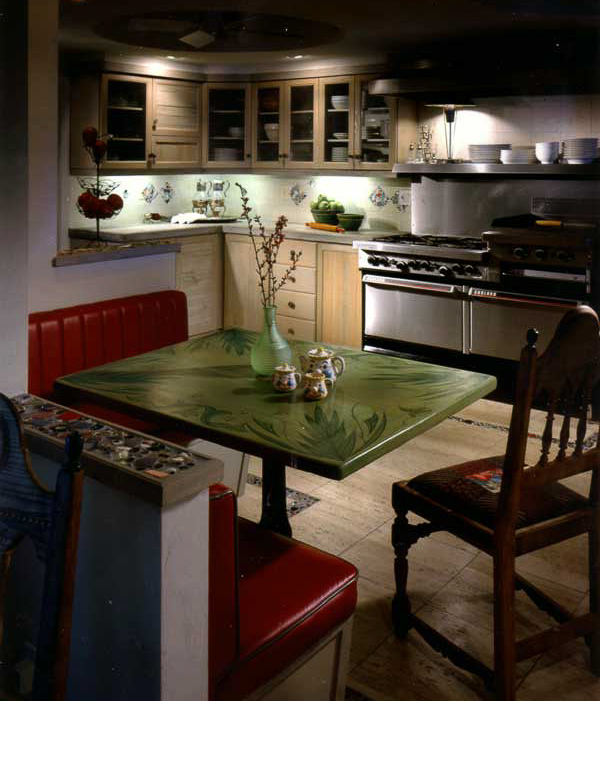 Faded jewel tones were used in the accents of tile and upholstery, to compliment mosaic work in the adjacent kitchen. A detail of mosaic broken tiles and artifacts, was used in the coral stone floor and backsplash. Various doors made of lath and screening were used in the cabinets throughout the kitchen. Industrial equipment was chosen to contrast the earthiness of the country style cabinets and counters. The Rosen's home was designed using subtle jewel tones among the mud tones of old woods, coral stone floors, patchwork brocade fabrics and artifacts, the two owners had collected in their travels. They had jars of broken tile, china, old coins and trinkets in their garage, they wanted to incorporate in their interior. After replacing a stone mantle in their family room with an old railroad tie beam and using recycled architectural pieces for valances, their hearts were sold on using traditional lyme paint, in driftwood tones on the walls throughout. Replacing the cabinet faces in the kitchen with doors made from up-cycled lath and screening, was only fitting to accent the stone hues with their found bits of mosaic on table tops and inset borders in the kitchen floor. The transformation of the home went from contemporary minimalistic, to rustic meets modern eclectic...much more in keeping with their tastes in art. What made this residence unique, was using the client's collections. They were very much a part of designing their home, the result being a very soft and rich space of hues and textures.